"Here we are, the health care capital of the world, and Nashville has recently been ranked as the fourth unhealthiest large city in the country," Weddle said. "We definitely need to address obesity and do something right here in preventing chronic disease and decreasing health care costs." "TNBC is excited to welcome Carol Daniels, the 2014 Philanthropist of the year, as our guest speaker. This is a great opportunity to come together and discuss the future of health and how we can do our part to keep moving Nashville to a healthier, happier future. " "Carol has been so instrumental in TNBC’s rapid growth and service to hundreds of women in the last four and a half years. " Over 165 individuals, businesses and community partners joined TNBC board and clients in supporting our annual 2015 Spirit of Wellness event. The Spirit of Wellness Award is given once a year to honor a TNBC partner who has dedicated their lives in support of improving the quality of life and wellness to those at risk in our community. This year’s award was accepted on behalf of J.D. Elliott, the 2015 honoree, by his wife Anita Raines Elliott and, Scott Perry, president, Memorial Foundation. New Beginnings recently celebrated the original founders and volunteer of the year, Libby Dorris, at our Summer Celebration on August 20th. This was such a fun event with an awesome band, great food and lots of great company. We are so grateful to all our founders. Without you, none of our success would be possible. 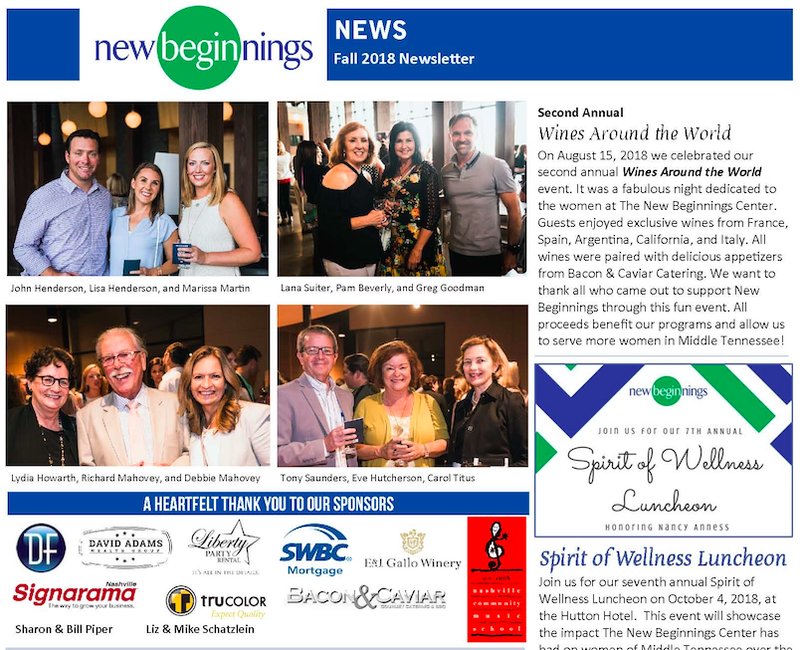 Over 60 guests came out to our Building a Stronger Nashville Open House on April 6th for some wine, hors d’oeuvres, music and to learn more about how New Beginnings is creating a healthy culture in Nashville. Thanks to all who attended this fun event.